Composed by Johann Sebastian Bach (1685-1750). Edited by Heinrich Besseler. This edition: urtext edition. Stapled. Barenreiter Urtext. Score. BWV 1051, No. 6. 28 pages. Duration 19 minutes. Baerenreiter Verlag #BA05206. Published by Baerenreiter Verlag (BA.BA05206). ISBN 9790006505005. 31 x 24.3 cm inches. Key: B-flat major. Preface: Heinrich Besseler. 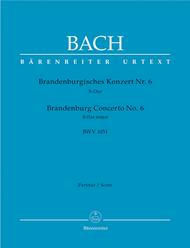 The six Brandenburg Concertos BWV 1046-1051 , prized jewels of the world's musical heritage , were written in 1721 during Bach's appointment in Cothen . Of the six works, Bach originally wrote earlier versions of numbers 1 and 5 which differ not only with regard to articulation but also at times different tones, different rhythms, instrumentation and of course form. 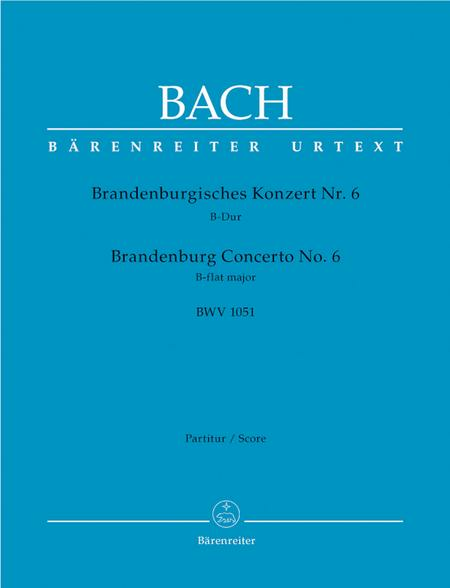 These Urtext publications [BA 5201-BA 5206] taken from the New Bach Edition now give performers the possibility to play these earlier versions perhaps even along side the version known today.